Note: The Kenosha County Fair is a westofthei.com sponsor. — DH. Youngsters will be pushing the pedals for all they are worth on Thursday and Friday at the Kenosha County Fair as part of the annual Pedal Tractor Pulls. The competition is open to youngsters from 5 to 12 years old. 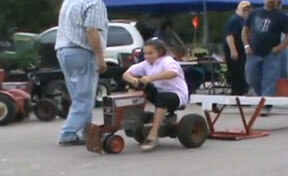 In pedal tractor pull, the kids pedal a special pedal-powered tractor pulling a sled that is a mini version of the type used in engine powered pulling competitions. The farther the competitor pedals, the heavier and harder to pull the sled becomes. The person that pulls the farthest with the most weight wins. The competition is divided up into classes by age. Prizes are awarded for the top finishers. Competitors can register between 10 and 11 a.m. Thursday and Friday of fair week at the 4-H exhibit buildings. The pull takes place nearby starting at 11 a.m. on Thursday and 11:30 a.m. Friday. There also will be a special pedal pull for 13 to 16 year olds on Friday at 11 a.m. This year’s fair runs from Aug. 19-23. Posted in: Kenosha County Fair, Sponsors.